When you are a homeowner you must be devoted to the maintenance and upkeep of your home. While some homeowner projects are clearly “Do-It-Yourself” projects other projects offer a better outcome by allowing a professional to do the job. One such project is reglazing. Reglazing is a cost efficient alternative to replacing your bathroom fixtures. Many surfaces in your bath can be resurfaced to look like new. Tubs, showers, counters, sinks and cabinets can all be reglazed. Maybe your home came with a beautiful antique claw foot tub but it is in bad shape. Why replace such a unique feature? 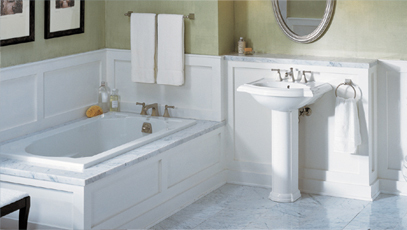 Perhaps your porcelain tub is dull, stained or cracked. Refinishing an existing bathtub can make it look and feel like new. All cracks, scratches, and chips are repaired and present no problem to the professional. Refinishing, reglazing or resurfacing any material of bathtub will provide the same result, a bathtub makeover. The best part of this process is that it is far less expensive than replacing your tub. The process of professional refinishing a tub takes up to 24-48 hours from start to finish. You will find your tub surface is smooth with new grout lines sealed. The surface is non-porous; dirt, mildew, and mold resistant, looking as if you just purchased the tub in the store. Your bathroom may be laid out perfectly but perhaps your shower is not up to standards. Instead of going through the hassle of removing an old shower and replacing it with a new one, you can simply have it reglazed. Whether your shower is tile, fiberglass or another material, it can be sanded, repaired and refinished to look like new. If your countertops have seen a lot of use and have scratches, stains or look dull overall, let your professional resurfacing contractor have them looking like new in no time. Even if you have a Formica countertop, it can be resurfaced. The countertop will be cleaned and lightly sanded to remove imperfections then resealed with a lasting and easy to maintain material that will bring them back to life. The sink is probably the most used part of any bathroom and over years the surface can become dull, scratched, stained or cracked. Replacing your sink may be an obvious but costly choice; a better option would be to have the sink reglazed by the professionals. Often in order to have your sink replaced your existing counter would have to be removed as well, this could lead to added costs and time. The average resurfacing job only takes a few hours plus drying time. You wouldn’t be able to use your sink for just one day as opposed to the few weeks it would take to remove order and replace. Just about every surface in your bathroom can look and feel like new with professional reglazing services. Call today for your free consultation to see how we can help you save time and money and most importantly have a beautiful bathroom.